Get your berries ready for this large batch DIY Muesli Mix that’s so easy to throw together and will make your morning meal routine a breeze! Place ingredients in your large jar, attach the lid and shake, twist and roll until evenly distributed. If using a large bowl, stir mixture and add to container of choice. Pour and serve: When ready to serve, add 1/2 – 3/4 cup of muesli to your bowl, add enough milk to cover and let set for about 5 minutes or so, until the oats soften a bit. Add a little sweetener of choice (I use a drizzle of maple syrup) and some fresh berries such as blueberries, raspberries, blackberries. Sliced strawberries and/or bananas would also be great. If you have dried mulberries on hand, throw some in as they taste great! When ready to eat, add a little extra milk as needed. Once you’ve made this a few times, you’ll find your perfect way. 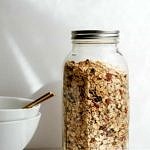 Overnight muesli: Add about 3/4 cup muesli to a mason jar or bowl, top with fruits of choice if you like, and cover with milk. Seal or cover and keep in the refrigerator overnight, or up to 3 days (you can make a few so they’re ready to grab and enjoy, or take along with you). Mix before eating, add a little extra milk as needed (if at all). Feel free to add 1/2 cup of flaked or shredded coconut. You can change up the dried fruit by adding dried cranberries, chopped dates, cherries or apricots etc. Add any nuts and seeds you prefer. Slivered almonds are great in the mix. Mix and match as you like making this your own!